Get 20% off *all Tula products by using my code : 20PEYTON at checkout! *Discount is VALID on all full price items + Starter Kits, Acne Clearing Kit, Holiday Sets. Discount is NOT VALID on previous purchases, gift cards, or auto-delivery items. I get SO many questions from y’all about my skincare routine, so I’m finally sharing my quick and easy 5 minute routine (that involves only four skincare products)! Growing up, the only products I used on my face were makeup wipes, a face wash in the shower, and moisturizer. No joke, I use the SAME moisturizer for 16+ years… If I got a pimple, I dipped a Q-tip in rubbing alcohol and dabbed it on the problem area (like I said, I literally only used three products on my face). I know that might sound crazy to some people, but I haven’t ever struggled with acne or anything like that soooo it’s really all that was needed. DON’T LET THAT MAKE YOU STOP READING (I’m about the share a skincare routine that can be curated around your personally wants and need for your skin)!!! As I’ve gotten older, and as skincare has become increasingly more popular, I’ve wanted to invest in products that are anti-aging and that give your skin a radiate, healthy glow. But, I’ve been reluctant. I’m a firm believer that less is more, especially when it comes to skincare, so I didn’t want to load a ton of junk on my face just because it’s the trendy thing to do. I want to feed my skin, not suffocate it, lol. BUT, then I discovered Tula!!! Tula uses probiotics as the foundation of all their products to promote hydration, clarity, and improve the appearance of inflammation. Tula products are formulated with powerful, natural probiotics, healthy superfoods (like blueberries and tumeric), and targeted safe ingredients (like AHAs, retinol (aka Vitamin A), and Vitamin C), to improve the look of the skin. All products are 100% free from phthalates, parabens, propylene glycol, petrolatum, gluten, mineral oil and are cruelty free. SIMPLY PUT, all Tula products are ideal for all skin types, skin tones, and genders!!! This product is awesome because not only does it clean your face, it also takes off your makeup. You only need two pumps, unlike other facial cleansing oils that I feel like you have to use half the bottle to feel like you got all your makeup off! My skin is normal/dry, so this stuff helps keep my face hydrated and happy (especially during the winter months). After days where I’ve had makeup caked on my face all day and feel like it needs an extra cleanse, I sub the Power Liquid for the Pro-Glycolic 10% PH Resurfacing Gel! This product helps remove any excess dirt or makeup left behind. Just put a few drops on a cotton pad and wipe your face after cleansing. Also, the Aqua Infusion Gel Cream is an alternative for the Power Liquid and great way to switch it up. ***Never let your skin get too comfortable with the same products! That’s why I like to change up my routine by subbing for similar products from the same brand. Doesn’t make my skin confused, but keeps it on it’s toes ;). THIS. STUFF. So. good. Y’all HAVE to try Tula’s Illuminating Serum (esp. paired with the Hydrating Day & Night Cream). Such an unreal combo. After this step, I’ve recently started incorporating the Revitalizing Eye Cream. I just got this product, so I’m still testing the results, but it’s supposed to work wonders for dark circles! I LOVE THIS STUFF!! I’m a moisturizer junkie who arguably uses too much, but I seriously only have to use half of what I do with other products when moisturizing with Tula’s Hydrating Day & Night Cream. This is my favorite moisturizer ever, which is a big statement from me because I was OBSESSED with IT COSMETICS Secret Sauce Moisturizer. I used to say if they ever discontinued it I would go to all my local Sephora’s and buy every single one so I wouldn’t have to go without it. A little obsessive, I know. Anyway, back to the point, Tula’s Hydrating Day & Night Cream has stolen my heart and lasts double the time my previous moisturizer did. Your skin will thank you for how incredibly soft and smooth it feels after using this stuff! 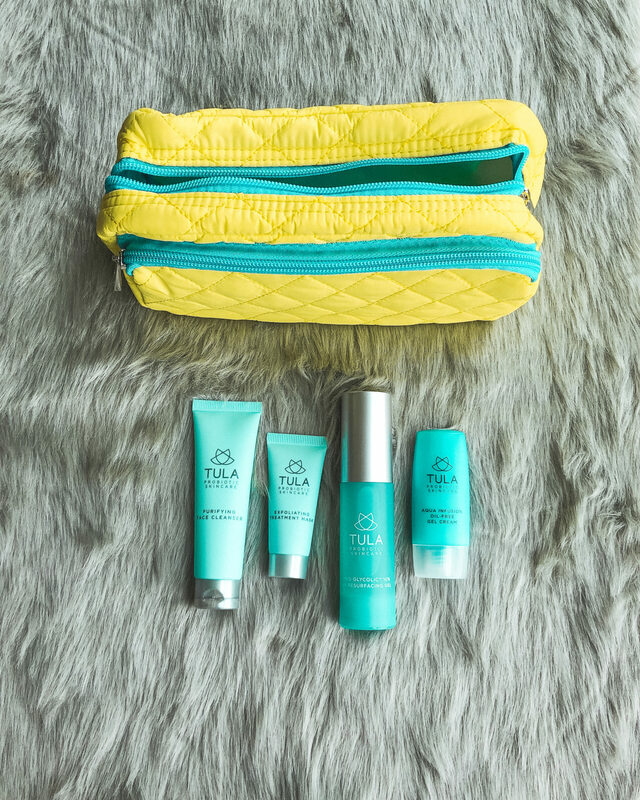 Tula Skin Quiz : Take a quick online quiz that then allows Tula to hand-pick products and curate a skincare routine just for you. No more guessing. No more trying random products. Holiday Shop : Stocking stuffers and little gifts anyone would appreciate! The Discovery Kit : All your travel essentials. The Clear Complexion Kit : Curated for hydrated, healthy and even-toned skin. The Anti-Aging Discovery Kit : Anti-aging essentials for youthful-looking, radiant skin. Great present for mom! Thanks to Tula for sponsoring this post. As always, thoughts & opinions are my own.